Wildlife officers are reporting more callouts to remove snakes from houses. 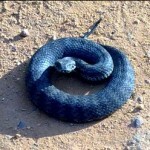 An officer told the ABC the snakes are hunting mice and frogs as they prepare to hibernate over winter. Police say a man dropped a snake onto a desk at Derby Centrelink office to scare staff. The 26-year-old was believed to be annoyed with staff during a visit a short time beforehand. He is due to face the Derby Magistrate today. New research shows death adder bites can cause permanent damage to the human nervous system. Medical researchers say neurotoxic effects occur even when antivenom injections are given quickly. You can read more about neurotoxicity if you click here. A survival expert who worked on Bear Grylls TV adventure series said his Kimberley stunts were carefully crafted. He gave the example of Grylls apparently catching, killing and eating a snake. “But it was actually two snakes: a roadkill that I found which he (was shown beating) on the head and eating, and then a live olive python that a wildlife carer had been rehabilitating,” he said. A Halls Creek man copped an $800 fine for keeping three black-headed pythons without a license. Wildlife smugglers are illegally taking Kimberley reptiles for a black market pet trade in eastern Australia. The Department of Environment and Conservation says the thieves can wipe out local populations of certain snakes and lizards.